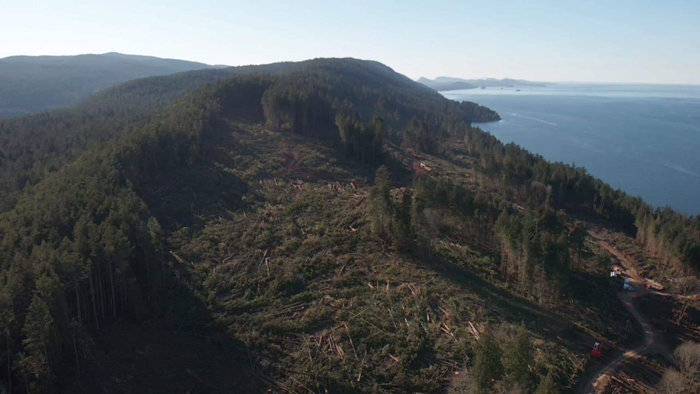 Aerial view of clear-cut logging on Tsawout and Tseycum reserve land on Saturna island. Photo courtesy Perry LaFortune Sr.
A controversial clear-cut logging operation on Saturna Island’s Indian Reserve 7 is on hold while Tsawout First Nation members opposed to the project continue a peaceful stand on the property. “We’re trying to make sure everything stops right now,” said Perry LaFortune Sr.
As of Monday, around 80 per cent of the 60-hectare parcel know as Block A had been cleared by contractors Chemainus Forest Products, on behalf of Tsawout and Tseycum First Nations. People who are opposed to the project are hoping to save the remaining 20 per cent, while Tsawout Band Council wants to complete the project before a March 31 deadline. LaFortune is one of the Tsawout members who has been “occupying” the reserve by being on site during the past week. His family is deeply connected to the land as a place to practise traditional cultural activities. A camp that his grandfather established and the family has used for generations is located just south of the new logging road. Money is a huge factor for the band council, which is struggling to find the funds for an important community project. Council member Mavis Underwood said after the contractor gets its cut, they expect around $2.5 million in profit, to be shared between Tseycum and Tsawout. In Tsawout the money is earmarked to build a new community longhouse where family and community memorials, namings, blessings and celebrations take place. The longhouse is deemed critical to maintaining community health and well-being. The building will also help generate revenue as it can be rented out when not in use. “It’s a decade-old plan that we’ve returned to every year. We’re trying to figure out a way to balance it out with our need for revenue and trying not to incur another debt,” Underwood said. Tsawout Council says the project was undertaken not only as an economic development opportunity but to remove built-up ground cover from deadfalls and debris, to help eradicate invasive plant species and to respond to concerns about root rot and beetle infestations.